Cuckfield shop owners are preparing for another unique late night shopping event in the heart of the village on Thursday 22nd November 2018 from 6pm to 9pm. Many of the village stores will be open until late as part of the special ‘Boutique Village’ evening which is set to entice many local people as well as visitors from neighbouring areas. The late night shopping experience will give those a chance to visit many of the boutiques on the high street, share in some bubbly and nibbles, whilst seeking out gift ideas and things to buy for Christmas. Participating shops will include: Artologie, Cuckfield Candy Store, Edit, Ensor Interior Design, Hairworks, JoJo Boutique, Nicky C, Neilson Boutique, Oliver Cunningham, Pepperbox, Sacred Cellar, Tigers to Lilies, Tom’s Food and Willis & Co.
First held back in 2003, Cuckfield’s Christmas Tree Festival is now well renowned in the area – and this year’s event opens on Friday 7th December at 11.30am. 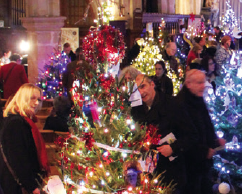 As ever the church will be adorned with over 80 decorated trees from local businesses and organisations as the building is transformed into a magical Christmas wonderland. There will be a festival café as well as various live music events during the weekend. On Friday the church is open between 11.30am and 7.30pm, on Saturday between 11.30am and 6.30pm, and on Sunday between 11.30am and 5pm – with a Carol Service to mark the end of the weekend starting at 6pm, followed by mulled wine and mince pies. The Tree Festival has raised over £70,000 for charities since it started, and this year Kangaroos has been selected as partner. Kangaroos works in the area catering for children and young adults with learning difficulties and special needs. On Friday 7th December 2018 the High Street will be closed to traffic from 5.30pm as the set-up takes place for the Christmas Street Festival – organised by Cuckfield Parish Council. 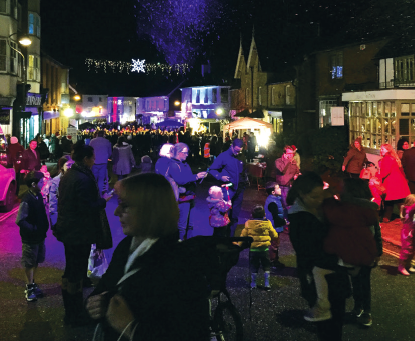 Lights and a snow machine will be set-up to add to the festive mood, while the road turns into a street of stallholders from charities and gift shops to food/drink offerings. If you are able to spare any time to help support this fantastic family event, Frances Laing at the Parish Council would love to hear from you (frances.laing @cuckfield.gov.uk). The Street Festival will be open between 6pm and 8pm, so do wrap up warm and go along!